These days, an increasing number of people are using computer to store memories, important documents, and various other precious information which need to be kept safely for long periods of time. However, the world is divided into two types of people: those who are suffering data loss and those who are about to. What's more people never take this seriously until data loss actually happens, especially when a backup file is not available. Actually, backups are very easy and convenient to keep, and there is no excuse not to have one. So, how to backup a computer? This article aims to teach you all the possible approaches of backing up a computer. People don't realize the importance of backing up system until there's something wrong with the operating system, which, however, is usually too late to backup computer system. It is a wise and effort-saving move to backup computer timely and regularly, especially for those who are tired of complicated steps of system reinstallation and those who don't know how to reinstall OS. Of course, some computer users still don't clearly know how to backup a computer, so read through the passage now. Creating a system image might be the most popular and secure way to backup a computer, because a system image creates a copy of installed programs, saved files and settings, which is stored in a separate location (usually a hidden partition), so that when computer goes wrong or crashes, you can restore files and programs safely and quickly from the image file instead of reinstalling system. 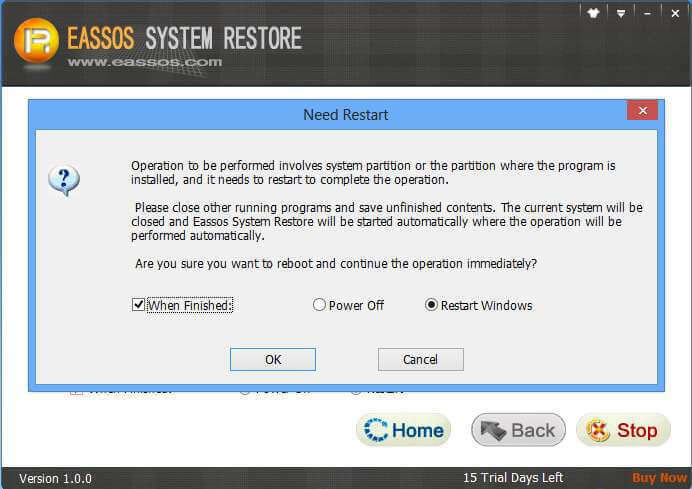 The first computer backup software chosen in this article is Eassos System Restore. You can add a remark for the backup, which serves as a reference for system restore; also you can click "Option" button to make advanced settings. Click "Next" button to move to next step. 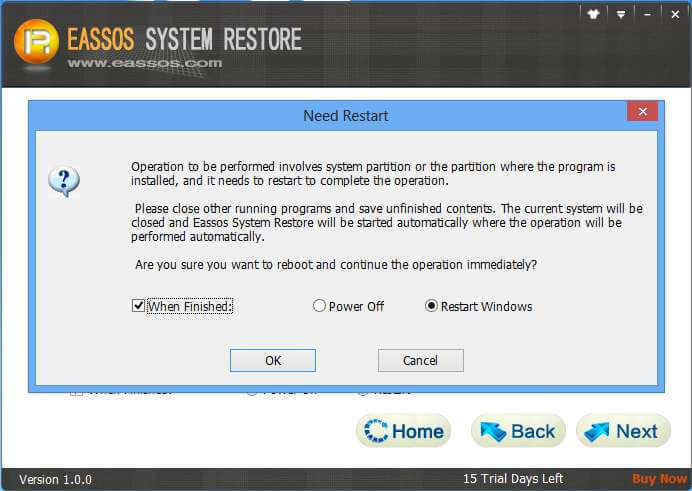 Eassos System Restore needs to enter its DOS to backup computer system, which is performed automatically after you click "OK". 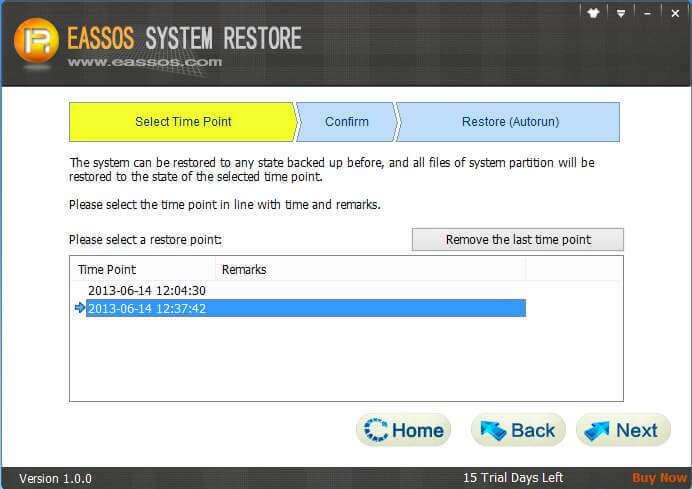 It is available to do incremental backup with Eassos System Restore, which can be carried out at any time. And system can be restored to any state you've backed up. Computer system, newly installed, usually runs fast and smoothly, but system will slow down as time passes. What's worse, sometimes computer can't run normally or can't boot. And that's when you need to restore computer. System restore takes less time and effort, which is why we need to know how to backup a computer and actually perform computer backup regularly. Select a time point you want to restore and click "Next". Confirm the information before you click "Next". The rest operations will be done by its DOS version automatically after you click "OK". 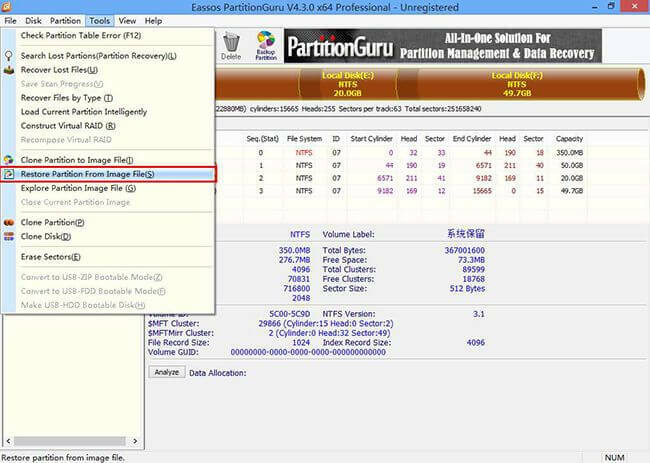 PartitionGuru is an excellent data recovery and disk management tool as well as great computer backup software. It provides powerful backup and restore function which can back up and restore system as Ghost. PartitionGuru is capable of backing up all available data of system partition to an image file which will be stored to a safe place, in order that system can be restored at any time. 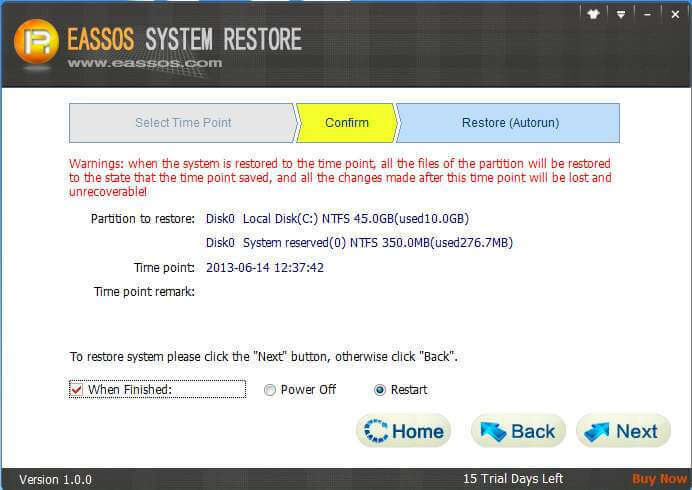 PartitionGuru can be an alternative of Eassos System Restore in that PartitionGuru supports incremental backup and it is also very easy to operate. Here are steps explaining how to backup a computer with PartitionGuru. Click the "Source Partition" button to select the system partition to be backed up and click the button "Select Image File" to choose a place for the image file. PartitionGuru performs full backup by default for the first backup. Next, click "Start" button and you'll get a report that the backup will be carried out by PartitionGuru DOS version automatically. After the backup is finished, it'll boot to Windows automatically. 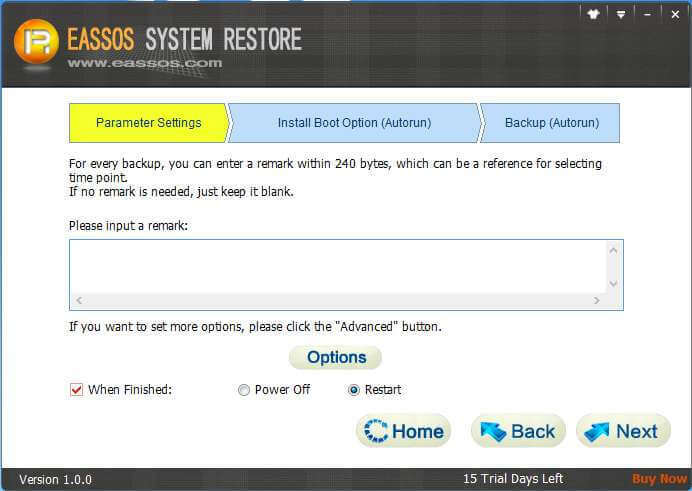 The whole backup process is similar to what Eassos System Restore does. The most reliable approach of preventing data loss is backing up a computer and the easiest way of avoiding operating system reinstallation is to restore system if a backup file is available. It's not possible to learn system installation in a very short time, while it only takes a couple of minutes to learn how to backup a computer and how to restore computer system. To restore system partition with PartitionGuru, first get the program started and then click menu items "Tools" and "Restore Partition From Image File" one by one. 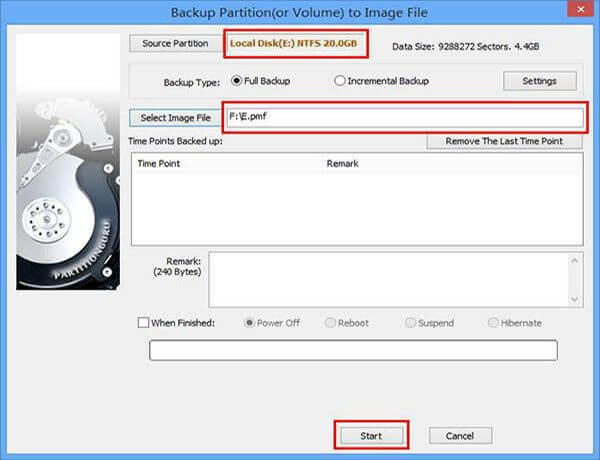 Click "Select Image File" button to select the image file previously backed up by PartitionGuru and click the button "Target Partition" to choose the system partition you want to restore. As incremental backup is supported, there might be several time points, so you need to choose one before clicking the "Start" button. The system restore, same with system backup, will be performed by the DOS version automatically. 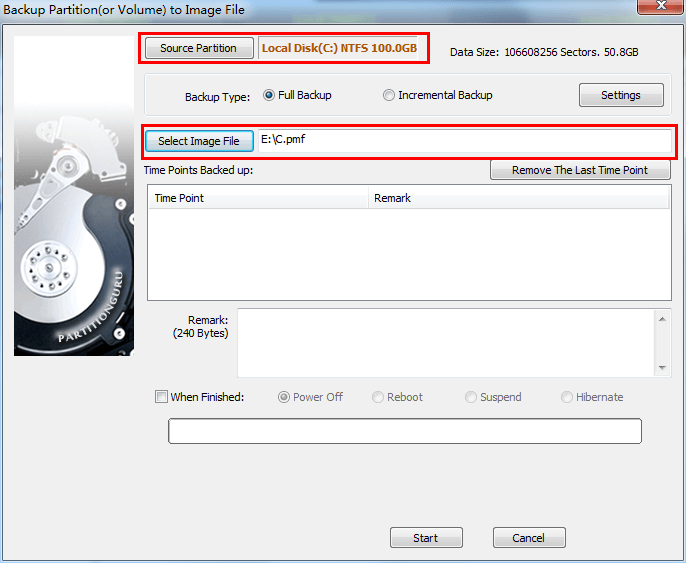 Click the button "Backup Partition" on the main interface of PartitionGuru. Select the partition you want to backup and the place to store the backup file, and then click the button "Start" to carry out partition backup. As the partition being backed up is not system partition, there's no need to enter DOS to perform the operation. PartitionGuru supports incremental backup that only backs up changed parts since the first full backup, saving time and efforts, which dwarfs other computer backup software. Then on the popped-up dialogue box select the image file and the partition that needs restoring. Choose the time point that you are tend to restore and then click the "Start" button to get the partition restore started. Ways of backing computer mentioned above back up one partition for one time, while this approach can back up the whole disk at one stretch. 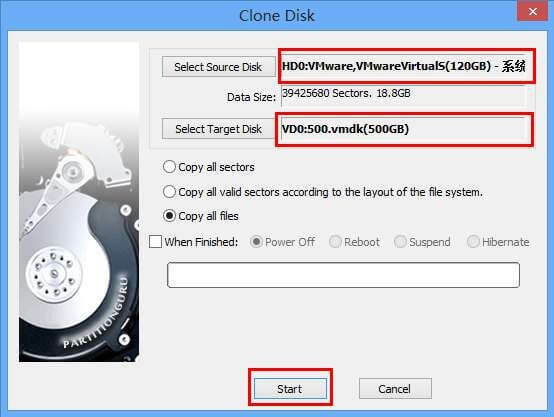 This function allows you to back up the computer to another disk without making any tiny changes, so that data on the target disk is the same with data on the source disk. PartitionGuru provides three modes of disk clone, i.e. copy all sectors, copy all valid sectors in line with the layout of file system and copy all file. Select the disk that needs cloning and target disk to save the backup file, and then click "Start" to carry out the operation. One important requirement is that the capacity of target disk shouldn't be smaller than the source disk. 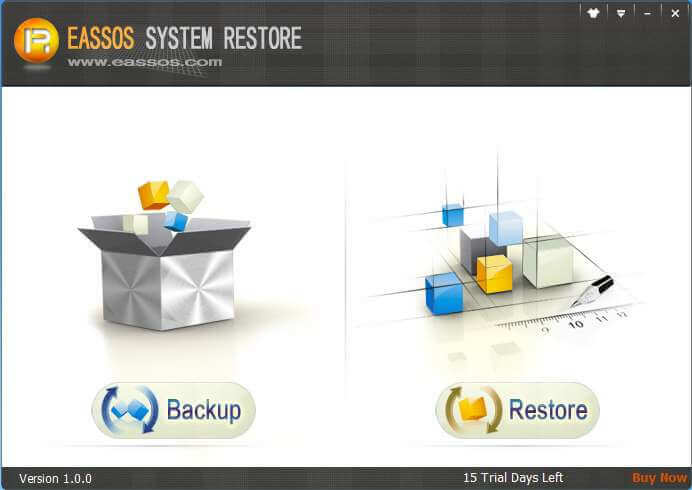 Eassos System Restore and PartitionGuru are the best backup software, with which you can complete all computer backup tasks, for example, backup computer system, backup partitions and clone the whole disk. Besides, operating steps are pretty easy and simple. Download the best backup and restore software from here.